You don’t need us to tell you Disney World’s the most popular theme park on the entire planet. Magic Kingdom alone boasts over 20 million visitors each year. 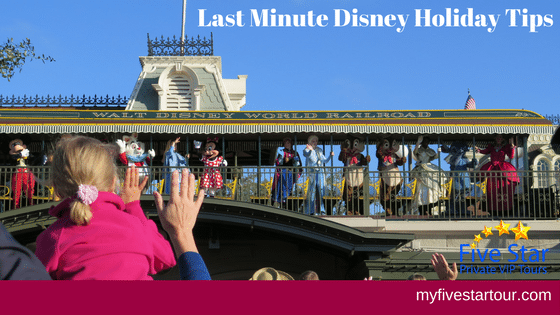 What you may not know, though, is what to do when planning a last-minute trip to Disney over the holidays. We’re talking about airline headaches, FastPass+ incidents, long lines, packed rides, and crying babies everywhere. Luckily, you’ve come to Five Star Private VIP Tours. We’re the home of former Disney insiders. We know secrets even old Walt didn’t. We may even know the parks better than your child’s favorite characters. More importantly, we know how to save your time, energy, and sanity over the holidays in Disney. Read on for some park insider secrets! People are going to pack all four parks no matter the day of the week over the holidays. Still, there are some days you should definitely avoid. Stay away from individual parks when it’s their Extra Magic Hours day. This is when the park opens one hour early or closes two hours later than normal. Magic Kingdom usually has Extra Magic Hours on Mondays, Wednesdays, and Fridays. Epcot usually has them on Tuesdays and Thursdays. Hollywood Studios usually has theirs on the weekends. Animal Kingdom is the wildcard and can have their Extra Magic Hours on any day of the week, though Monday and Saturday are the most common. What could be nicer than sharing a family lunch at Cosmic Ray’s Starlight Café? How about leaving with your sanity (not to mention your wallet) intact? Eat before you head out to the parks and after you leave for the day. Not only will this save you some serious time – which means more rides, attractions, and fun – but have you ever seen a child yelling because they didn’t get an extra special Mickey straw? You don’t want to, trust us. Extra tip – head over to Disney Springs for dinner. They have a lot of family friendly options and offer live entertainment every night. You know what’s worse than waiting an hour or longer to take your child on It’s a Small World After All? Letting that wait ruin your entire day or even your entire vacation. There’s bound to be some sort of setback at Disney. It’s just the nature of the beast. Remember, 20+ million people walk through Magic Kingdom each year. That means delays are inevitable. It’s important to take them in stride or, as we like to say stay calm and Disney on! In fact, being flexible’s probably one of the most important tips you’re going to get. You can thank us later. Want to skip the long lines? How about having a one-of-a-kind experience with Micky and pals? Access to special attractions and exclusive shows? Yep, hiring a private guide covers those too. This is a where we take off our good advice hat and put on our certified expert hats. See, we weren’t joking when we said we knew the parks inside and out. We have over twenty years’ experience and can help you avoid the stress. When you need a Disney VIP Tour, contact us today. We’ll take care of the details. You’ll take care of having a great time. Ever heard of the Kiss Goodnight? You’re not alone if you’re scratching your head and saying huh? The Kiss Goodnight is how Disney says have a good night. It starts a half hour after the Magic Kingdom closes and plays on repeat every half hour after. You’ll know it’s starting when the Cinderella’s Castle starts lighting up and “When You Wish Upon a Star” starts playing. The rest? You’ll have to experience it yourself to find out!